The moon rules our emotions, and the full moon can amplify them dramatically, which can lead to a mix of miracles, mayhem—and, at times, madness. During a full moon, the radiant moon’s glow in the sky is brighter than at any other time of the month. This allows us an opportunity to see what is usually hidden, which includes the visible and the invisible; for example, becoming more aware of our own (and other’s) physical behaviors and emotions. Humans consist of approximately 70 percent water—and in a similar way to how the moon’s gravitational pull affects the ocean, it also pushes, pulls, and stirs up our emotions. Within our relationships, this can cause existing issues to come to a head, and many find themselves experiencing tremendous personal shifts, which can lead to closer connections, break-ups, or some form of drama to erupt. Full moons clear out old, negative energies to make way for fresh, positive, new beginnings—which is why we often feel edgy, triggered, and quite argumentative during this period, as we go through an emotional unearthing and cleansing phase. We may find ourselves reaching out to those we’ve been temporarily estranged from. This is a vulnerable period for many who are highly sensitive to the moon’s energy—and though vulnerability is often seen as a weakness, it humbly draws us to our knees and opens our hearts. Full moons are typically the days when we find out what other people think of us, and this can work both ways—positively or negatively. The reason for this is that we are generally less fearful when the moon is full above us, and this allows us to express our deepest heartfelt emotions—either by sharing secrets with a close friend, confessing how we truly feel to a loved one, or letting those dearest to us know how much they mean. However, while we are under the full moon’s spell, we may also find ourselves projecting our anger or irritation onto others, or find that other people are projecting their frustrations onto us. Usually, people find that they struggle to contain what they’ve been thinking or feeling when the full moon arrives, and they uncontrollably churn out harsh words that they later wish they had kept to themselves. This is why it is vital during this period to meditate often and remain grounded—as, otherwise, we risk absorbing the emotions of those around us. If we do not remain in the present moment during a full moon, we will end up carrying other people’s emotional loads—and along with the weight of our own emotions, we could easily become overwhelmed and fatigued by it all. It usually feels like we are more irritable than usual during the full moon, though what’s actually happening is that our intuition spikes, we are far more hypersensitive, and our awareness of everything occurring in our lives is heightened. Therefore, we are simply noticing the things that existed throughout the rest of the month, but subconsciously, we’ve turned a blind eye. During a full moon, insights arrive in sudden bursts of information providing liberating answers to the silent questions we have been deliberating in our minds. This supports us in getting to the root of what causes persistent patterns, unhealthy habits, and destructive dynamics within our relationships. Many of us feel empowered during a full moon to be authentic in our dealings with loved ones and to find our voice and frankly speak our truth. The most important thing to remember is that if we want do not want to burn bridges, we must try to be compassionate, so we can express our thoughts and feelings with tact and care, rather than through irrational, emotion-fueled outbursts. The full moon phase encourages us to dig deep into our souls. This takes us through a beautiful metamorphosis as we purge the huge mass of built-up feelings and emotions—all the thoughts, beliefs, and truths that we normally try to reject or deny forcefully spill out. Whenever we are faced with extremes, we also receive the opportunity for dramatic transformation. Therefore, as much as full moons feel turbulent, they always serve our best interest and are a vital component for our personal growth and for reaching the highest version of ourselves possible (if we are willing to pay attention and not get caught up in the intensity). We can waste vast amounts of energy due to suffering for what we no longer have or what we wish for in the future. Our minds can play endless games, rushing to the past to yearn over romantic losses and then darting toward our illusions of the future, without slowing down so we can consider and appreciate what we have now. 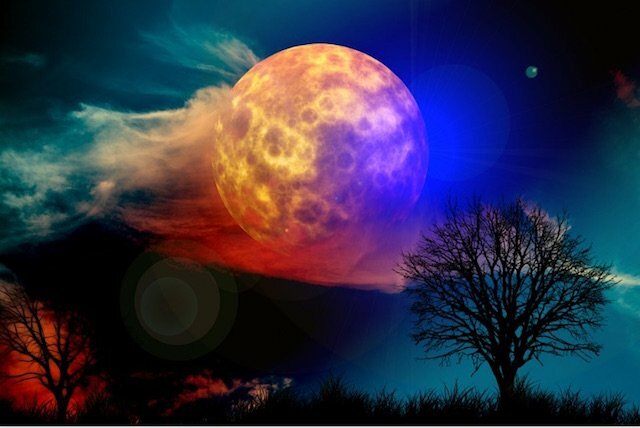 Many of us notice the impact of the full moon up to five days before and five days after it peaks—though generally, it is at its most intense on the day before, the day of its fullness, and the day right after.